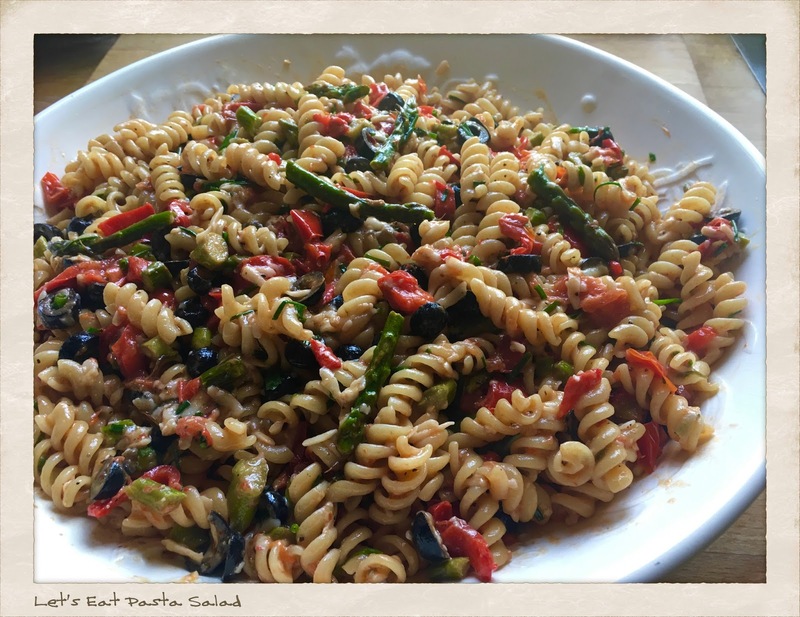 This vibrant Pasta Salad is one of my favourite go-to warm weather meals-in-a-bowl. It’s flavourful and filling on it’s on, or combined with homemade chicken fingers, grilled smoked sausages, or your favourite deli meats. It’s delicious served warm, at room temperature, or straight out of the fridge. I usually serve at room temperature as part of a summer buffet. You’ll need about an hour to prepare. I use Garofalo’s Organic Dried Fusilli. or Garofalo’s Penne Ziti Dried Rigate. Any hard Italian Cheese works well, just keep in mind that these style of cheeses tend to be salty. Taste your salad once you have mixed everything together and decide if it needs a tad more salt or not. Optional: I usually add a bit of green to the salad. My choice depends on what’s in season at the time. About 250g (half a pound) of any of these lovely vegetables works beautifully. Asparagus; Tenderstem Brocolli; Friggitelli Peppers, or 90g (3 ounces) of Rocket (Arugula) tossed in just before serving. Heat oven to 175c. Prepare a large baking tray (with lip) with 120ml of olive oil and the seasoning (chili flakes; pepper and half the salt) mix well. Wash the produce you’ve decided to use. Slice peppers and deseed. Cut into small bite size bits (I use scissors for this) Toss onto baking tray. Cut off top of garlic bulb with sharp knife, add to tray (you’ll bake this whole, then squeeze out the paste) cut up the asparagus, broccoli, or whatever other roastable veg you choose to use. If you’re using Rocket, wash and set aside, don’t roast it. Mix all the vegetables together with olive oil and seasoning with your hands, make sure everything is well coated, including the garlic. Roast in hot oven for about 30 minutes, turning once. While vegetables are roasting, fill a large pot with water. Bring to boil over high heat. Add remaining salt (about a tbs) Stir. Add pasta. Cook for seven minutes (I know the package says 11 minutes, but trust me, that’s way too long) Pasta will be very firm but will soften up when you add everything to it. You want the it to still have a bite to it when served. Remove roasted vegetables from oven. 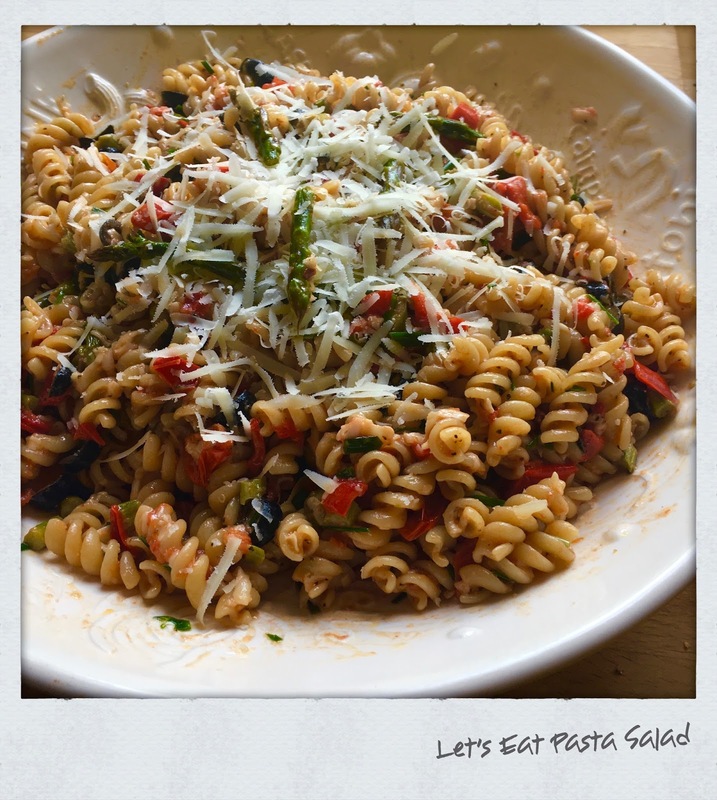 Allow to cool a bit while preparing pasta. After seven minutes, drain pasta in collander. Add roasted vegetables to the now empty stock pot you cooked pasta in. Be sure to get all the oil and seasoning from roasting tray. Add the drained pasta. Mix well. In small jar or jug, combine olive oil and Balsamic vinegar. Mix well. Pour over the pasta and vegetables. Mix throughly. Drain sliced olives from jar (or slice them yourself) and toss into the pot. Chop chives. Toss into the pot. Grate cheese. Toss into the pot. Mix everything gently and throughly. Transfer to large serving bowl and serve. Leftovers keep well in the fridge for several days. Serve with ice cold glass of (your choice, as long as it’s Italian) Processco; Peroni; Moretti; Lemonade; Limeade; Grapefruit Soda; Sparkling Water. For dessert, break out the ice-cream cones.